Cosco C 1000 R Exercise Bike is a commercial exercise bike. 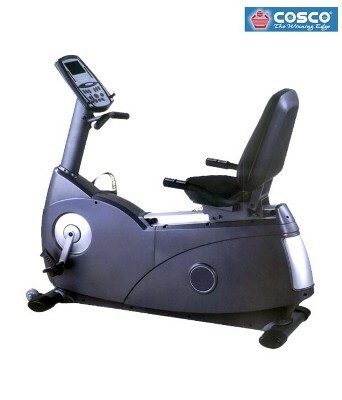 This recumbent exercise bike has self generating electronics, friction-free electromagnetic resistance and other superb features like programmable computer with programs and large windows LED readout. Push Computer Button Resistance Change. Large Adjustable Seat & Back Cushions. Adjustable Deluxe Aluminium Carriage Tubeand Seat Carriage. Working Size : 1450 x 620 x 1280 mm. Extra Sturdy and Stable Steel Frame Construction. *Note: Most of the sites, stores or shopping portals listed above sell Cosco C 1000 R Exercise Bike with discounts and other exciting offers. There is a possibility that the some of above websites are not selling Cosco C 1000 R Exercise Bike now. Toughtrain.com is not liable for such cases or instances. Also we do not recommend any seller for Cosco C 1000 R Exercise Bike and a buyer should buy from where he/she gets best deal with quality of products, service and on time delivery (shipment).